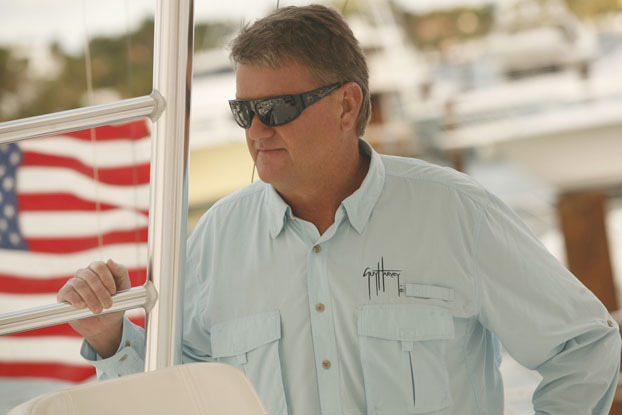 In the sportfishing world, Guy Harvey is a true renaissance man. Over the last 20-plus years he has somehow found the time to grow his brand into one of the most recognizable in the industry, create countless works of art, complete important studies on a range of game fish, start several foundations, write books, film documentaries, attend fisheries meetings, fund fishing expeditions, raise his family and still find time to go fishing. One look at Guy’s track record and it’s easy to see his true motivations. His drive is not just about selling his products or building the Guy Harvey brand. It’s not that at all. 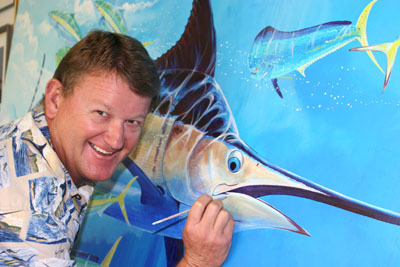 Guy Harvey’s drive is all about giving back to the marine resource. Guy grew up in Jamaica and quickly developed a love of all things related to the ocean. He studied marine biology and went on to earn a doctorate degree in fisheries management. In 1985, he depicted Ernest Hemingway’s “The Old Man & the Sea” through a series of 44 original pen-and-ink drawings. This was the start of his career as a wildlife artist. The Guy Harvey brand is now one of the largest and most recognized in the fishing world. His art can be seen in galleries, homes and boats around the world. The Guy Harvey clothing line continues to be one of the most popular among recreational anglers, and it is through this success that Guy has been able to give back to the marine resources he cares so much for. Harvey began donating portions of the proceeds from the sale of his products to various causes decades ago, and his first major contribution came in 1997. Working with the Pompano Beach Rodeo, a popular fishing tournament in south Florida, Guy and his team helped to create an artificial reef by sinking a 200-foot ship. Now known as Guy Harvey Reef, this site has been an economic driver for south Florida, attracting both anglers and divers. That was just the beginning. Two years later he formed the Guy Harvey Research Institute at Nova Southeastern University. “I reached a threshold in my business career where I’d built up enough resources that I felt it was time to contribute back more, particularly in the field of fishery science,” Guy says. Based in Fort Lauderdale, Florida, the Oceanographic Center of Nova Southeastern University has been able to provide the scientific information necessary to understand and make a difference as the world’s fish resources battle ongoing declines thanks to this partnership. GHRI is one of only a handful of private organizations dedicated exclusively to expanding the scientific knowledge base needed for effective marine conservation and maintenance of fish biodiversity. This was the beginning of Guy’s commitment to cause marketing, which has become a vital aspect of his business model. Guy has established a pre-condition that any licensee of his artwork contribute a percentage back from the sale to conservation. In the 13 years since its inception, GHRI has completed numerous studies, especially on sharks, which have undergone some of the most drastic declines of any ocean predator. The organization has also published 45 peer-reviewed papers in the last 12 years. It’s the real deal, and their scientists are out there in the field making a difference. 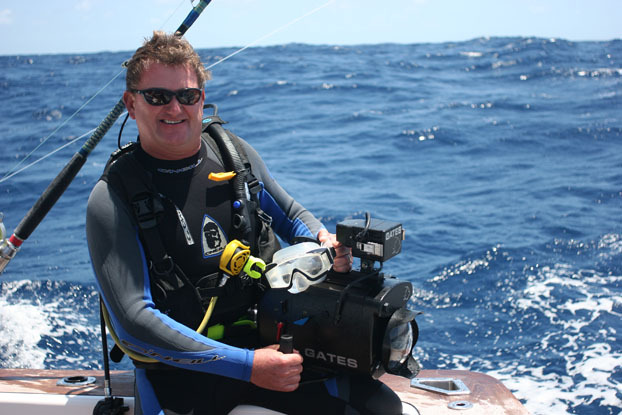 While GHRI continues to conduct research both domestically and abroad, Guy decided that he also wanted to do more outreach and educational work, so he formed the Guy Harvey Ocean Foundation (GHOF) in 2007. In the last three years GHOF has awarded more than $3.5 million in research and education grants. The grants have gone to several universities as well as state organizations and youth groups. Much of this money has come from strategic partnerships. In the state of Florida, some of that money came from a special Guy Harvey license plate, and a new program with the Florida Lottery that features Guy’s art on scratch-off tickets promises to bring in even more funds. When the Deepwater Horizon oil spill rocked the Gulf of Mexico in 2010, Guy Harvey and his partners at AFTCO stepped up to the plate. Guy created a unique shirt design and together they marketed the “Save Our Gulf” shirts to raise money to help the region get back on its feet. In just four weeks, they sold 50,000 shirts, raising more than $500,000. To date the Save Our Gulf fund has given out $539,732 in grants across the Gulf region. A symposium will be held September 14-15, 2012 to review the success of the Save Our Gulf programs that these funds helped. It will also provide a platform for the various groups to corroborate about the experience and what they’ve learned. All of the research and recovery efforts will be laid out in black and white for everyone to look at. The success of the Save Our Gulf program initiated some rumors that Guy Harvey and AFTCO profited from the sales of these shirts. 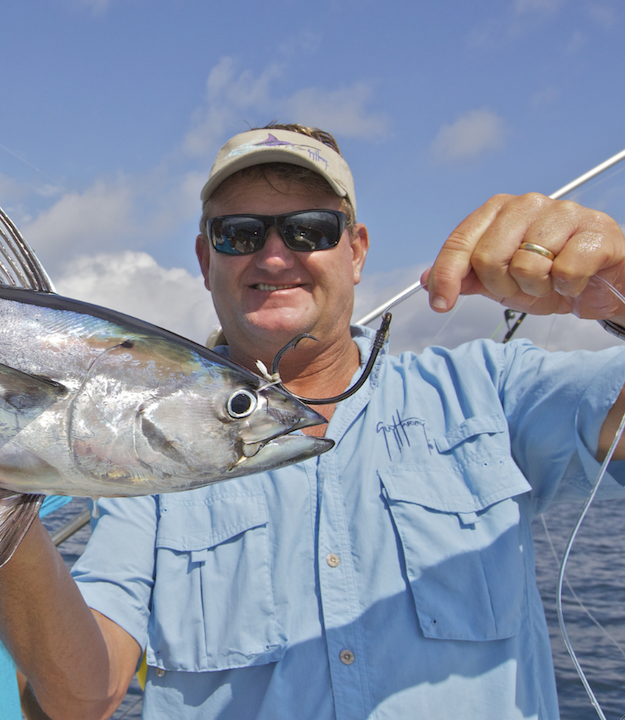 These rumors are unwarranted, and Guy Harvey and AFTCO have nothing to hide. Anyone who has any doubt about how this money was spent is encouraged to attend the Gulf of Mexico Fishery Symposium in St. Petersburg, Florida. The programs mentioned above are just a small sample of the conservation work and research that Guy and his colleagues have accomplished over the years, and that work goes beyond the fishing industry. Guy Harvey’s line of military themed apparel raises funds for programs such as Wounded Warriors and the Gary Sinise Foundation. Guy has also donated his art to all sorts of groups over the years including Rigs to Reefs, the International Game Fish Association (of which he is a Board Member), Coastal Conservation Association and many more. The diversity of the groups he works with is a testament to Guy’s open-mindedness. He’s always willing to listen and get involved in a cause, especially when it involves a species of fish or program near and dear to his heart, such as sharks and billfish. 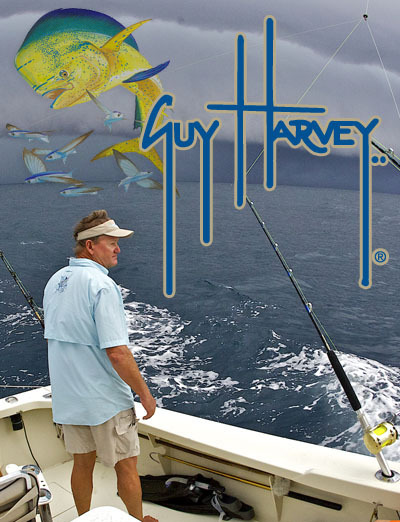 The list of projects and campaigns that Guy Harvey was worked on is long and diverse. And some of those programs have recently come under fire. The Shark Free Marina Initiative is one such program that is being unjustly attacked. The shark free/friendly concept aims to educate people about the severe pressures put upon shark populations and to think twice before needlessly killing a shark for a photo. It encourages catch and release but does not advocate any sort of fishing ban whatsoever. “If you are not going to eat a legally caught, legal-sized shark, then you should release that shark,” Guy says. Much of the criticism stemmed from the role of the Humane Society of the US (HSUS) within the SFMI initiative, as well as Guy’s alleged ties to PETA and the PEW Environment Group (PEG). Any time you mention these groups it raises a red flag with recreational anglers, who’ve been needlessly attacked by extremist organizations in the past. 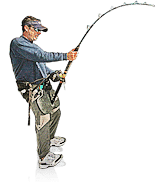 “As for Pew, I am not aligned with them personally, nor have I supported them during my 20-year tenure as a board member of the IGFA. The one instance in which I worked alongside PEG was in a successful effort to prevent the archipelago of the Bahamas — which was home to the last bastion of sharks in the western Atlantic — from being scoured of sharks by impending commercial interests,” he wrote. Because of his work, Guy is sometimes unjustly called a tree hugger, which is actually pretty funny because it’s so far from the truth. It worked. 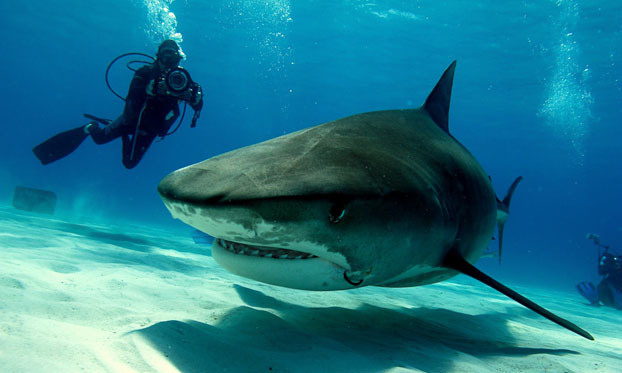 In July, 2011 the Bahamas protected sharks from the commercial exploitation. It took several organizations to make this happen, and while the sharks won an important victory, so did the marine ecosystem, as well as anglers. “We have to collaborate, step by step to make an impact,” Guy says. If you’ve ever seen Guy interacting with his fans at one of his signings, you can tell that he relates to all fishermen, because that’s what he is first and foremost. So next time you hear someone utter a word like “sell out” when talking about Guy Harvey, think of everything he’s done to help the marine species he cares so much about. And remember that each and every product with a Guy Harvey logo on it is helping fund more research and conservation for future generations.